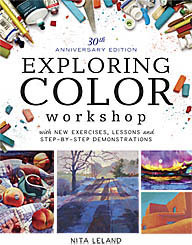 A few days ago the Western Ohio Watercolor Society in Springfield, Ohio, hosted Merle Rosen, one of their certified teachers in the use of Golden acrylic paints. Her demo was fantastic. She worked for 90 minutes, slathering acrylic products onto demo boards and passing them around for all to see. The single most enlightening demo was that of the new Open Acrylics by Golden. She painted two thick bands of paint side by side on a board and set them aside. Every 15 minutes she swiped her finger across each band. In about 30 minutes, the regular acrylic stroke was dry. The Open stroke was still wet when the meeting ended nearly 90 minutes later. Merle's talk was filled with information, from the structure of acrylic paint film to acrylic techniques and special mediums. Their product line is awesome. I use acrylics mostly for collage, but the demo has me thinking about adding in more paint and special effects. (BTW, I don't work for Golden!) After reading the three books on acrylics that I recently reviewed, I'm impressed with the possibilities of all acrylics. These products were just getting on their feet when I began painting watercolors in 1970 and I didn't like the plasticky feeling of the paint, which didn't dissolve on the palette like watercolor. I find it much more pleasant to work with now--creamier, I guess--and the colors are incredible. I recently read a review of Ampersand Aquabord (textured Claybord)that is said to be a good support for acrylics. Looks like I'll have to do some experimenting.